Pauline Smarrella Lane grew up in Steubenville, Ohio, a town largely populated by Italian immigrants who had come to work in the steel mills located on the banks of the Ohio River. Pauline’s grandparents came from small villages in southern Italy. They chose to settle in Steubenville so their neighbors would be familiar and their children could be surrounded by the culture and food of their homeland. The community church had an Italian priest and almost all of the students at the parish school were from Italian families. In fact, when Pauline’s daughter was in second grade, she came home and announced that Italians came from Italy. From all of her visits to Steubenville, she had thought they came from Ohio. Pauline began her studies in Home Economics but eventually switched to Economics and Political Science, spendingmore time campaigning for Kennedy than on her studies. She attended graduate school at West Virginia University, where she met and married her husband Jim (Bucky). She remained a political junkie, but as time went on she also became more and more a cooking junkie. Soon after Jim and Pauline had their first daughter, they moved to the Pacific Northwest. By 1968, a second and third daughter had arrived. While Pauline loved her life out west, she began to miss the food that she had known all her life. 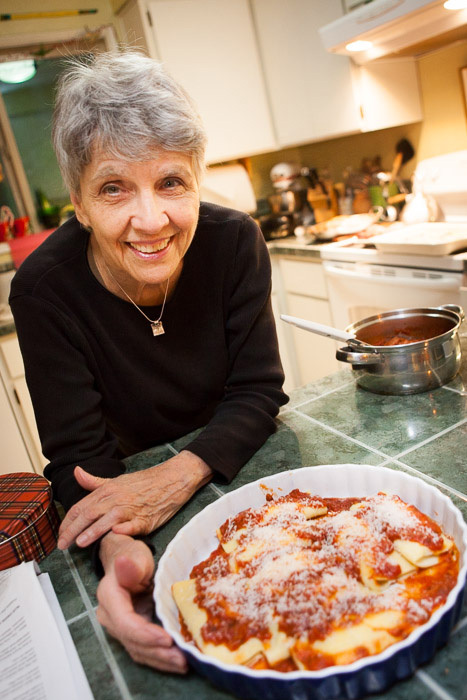 As a young girl, she had learned some cooking skills, but mostly as a kitchen helper– sealing the ravioli with a fork, rolling the gnocchi to create a pocket and popping the skins off the garbanzo beans. And so she relied on trips back home to hone her cooking skills and to pack up the ingredients that, at the time, were nowhere to be found in Eugene, Oregon. Pauline worked hard at mastering the important dishes of her childhood, and over the years grew confident enough to teach Italian cooking classes. She cooked for a soup kitchen, and after picking up a few tips while working at a restaurant, became an occasional caterer. She also served as director of a facility that provided food boxes, energy assistance and vouchers for dental care and prescriptions. She has passed along many tried and true recipes to her daughters and friends, and even wrote a cookbook, “Cooking with Noni,” which we used to prepare the dishes we’re serving this month.